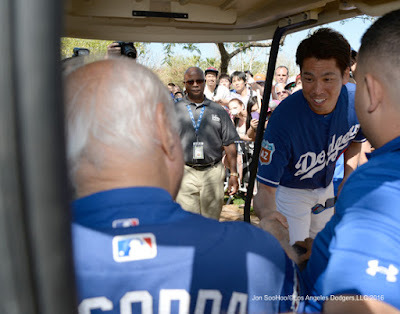 Kenta Maeda greets Tommy Lasorda in the photo taken above by Jon SooHoo/LA Dodgers 2016. Via Ken Gurnick at MLB.com, "Kershaw: Koufax 'cares for us as a team.'" "Whether or not he's officially here, he's still around," Kershaw said of Koufax, who has ended his three-year stint in the front office but visited the club on Friday. "I don't think it will change much for me. Sandy cares about us as a team, and I think he will be around when he can, and he'll watch our games." Via Eric Stephen at True Blue LA, "MLB Draft 2016: Dodgers will have nearly $10 million in bonus pool money to spend." Via Doug Padilla at ESPN, "Mound visit: Getting to know Dodgers pitching prospect Julio Urias." Earliest memory: "I always remember the first baseball glove I ever received, and the first pair of spikes. My grandfather visited the United States and he came back and gave me the glove with the pair of spikes. I still have the glove at home." This is just the case of the same problem, different day. Via Ken Gurnick at MLB.com, "Gonzalez sits out workout with neck discomfort." "It's the same thing I've been dealing with and we had it looked at over the offseason and we know exactly what it is," said Gonzalez, the most consistent bat in the Dodgers lineup since he arrived in 2012. "There's not much we can do about it. It's a bulging disk and it's too risky to operate. Just pain management. I wasn't smart with the base-running drill. I have to stay away from things that irritate it."